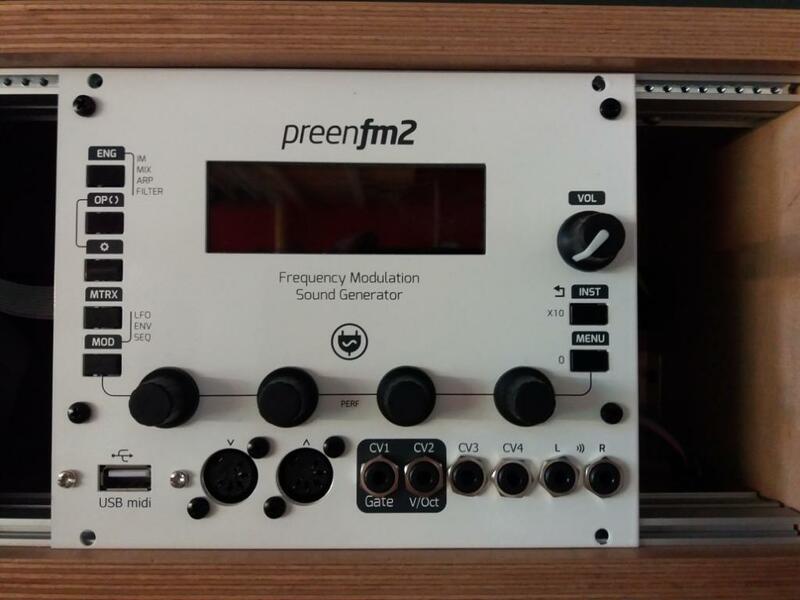 I am starting this thread to give more information about the PreenFM Eurorack implementation. We have now finished the case design. Beta panel looked like this but had some mounting issues etc. So we had to make a change. Current and the latest revision. Unit has total of 5 different PCBs. So its a bit complex build but it can be DIY kitted and assembled with good instructions. 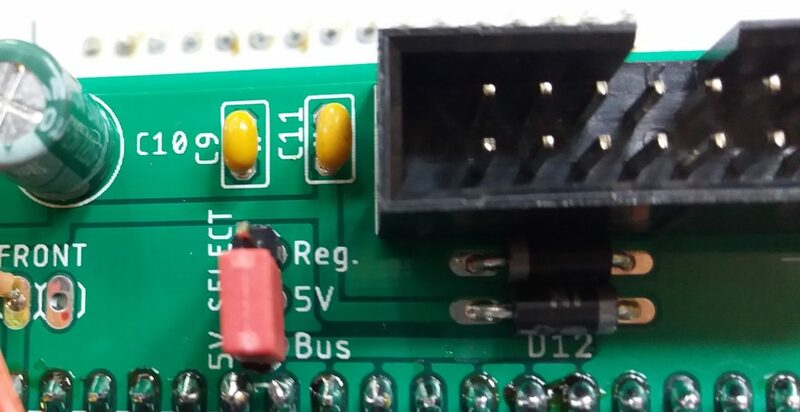 CV1 is routed to GATE and it triggers a note. 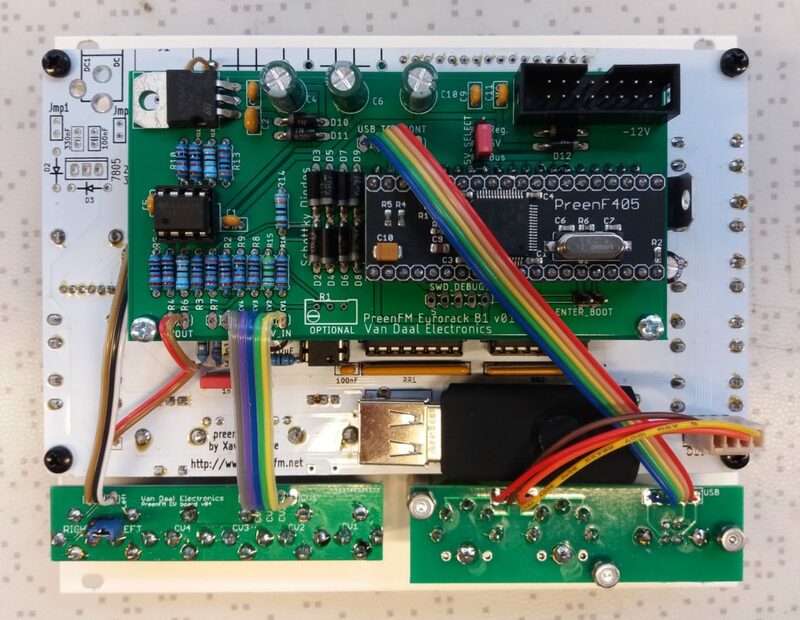 Gate input is limited to 3V pulse. So it is only capable to trigger something like Gate but also it can be mapped to the matrix. CV2 is routed to V/Oct input. It is designed to get 0V to 10V input. 1V is one octave. 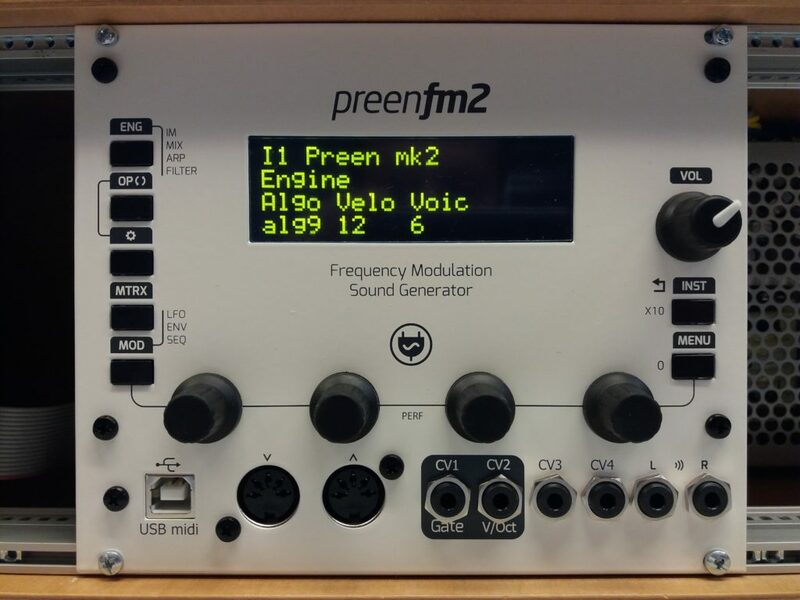 PreenFM is using only 8 octaves on that input. CV3 and CV4 are similar -5V to +5V. All the inputs are buffered and voltage protected. meaning that they can take anything coming from Eurorack system. Takes a normal Eurorack +/-12V power and +5V. There is an onboard 5V regulator if your eurorack system doesnt have a 5V rail. You can choose to use that regulator by connecting a jumper to "Reg." position. Or to "Bus" if you have a 5V bus. On the Audio outputs there is an option to use a stereo cable by having a jumper installed to RIGHT-LEFT link pins. Then Stereo output is LEFT channel out. USB power has 5V supply cut to escape various powering issues. Total 400mA current draw, using +5V; +12V; -12V; bus. I will post some videos in the near future how it performs. We will start to produce the modules assembled this month. Any feedback is welcome and will help with the developement! Very excited about this! Built mine in a panel with the CV inputs, but they're not hooked up to anything yet. I need to learn more about voltage scaling first lol. I will definitely watch the videos and read any docs you have when there available! Keep up the good work! Tested the PreenFm with Doepfer A-105 filter and it plays really well. So Preen audio output should be enough for most of the Eurorack modules. On request by Matthis I have made a post into ModularGrid database. This is just a demo-post to test how it acts. I will fill in the correct information in near future! Measured Current Draw on each rail. No audio. Just a task in the topic and deomstration. As it turns out some people dont know how to load patches and do other stuff. The Third version will introduce fully functional CV1 CV2 CV3 CV4 with +/-5V CV input. Switchable CV1 CV2 to 0-10V CV signals. Digitally Adjustable gate level. Firmware update made by Xavier. We are working on this. Its still unclear how it will exatly look like. But electronically such solution has been tested and it works with no issues. Case design and how to mount it is the next part now. We have finished building the Pre-production patch of Eurorack modules. All the units come with Blue OLED screen. Also a Black front panel has been introduced and will be an option. A conflict with fat Eurorack aluminium rails has been discovered. It involves only some racks that have thicker aluminium rails. Doepfer and Gie-Tec type rails are fitting nicely. We will work on to make the unit fit. It introduces some adjustments on the PCB sizes. It only affects customers with odd rack rails.